Undeniably, I'm definitely an Angry Bird fan. If you are my blog's followers, I believe you've seen my previous cupcakes creation (Angry Bird Cupcakes) & Hankerie's Angry Bird Cupcakes featured in whysoangrybirds.com. Received quite a lot of comments and some private email on this, thank you so much. 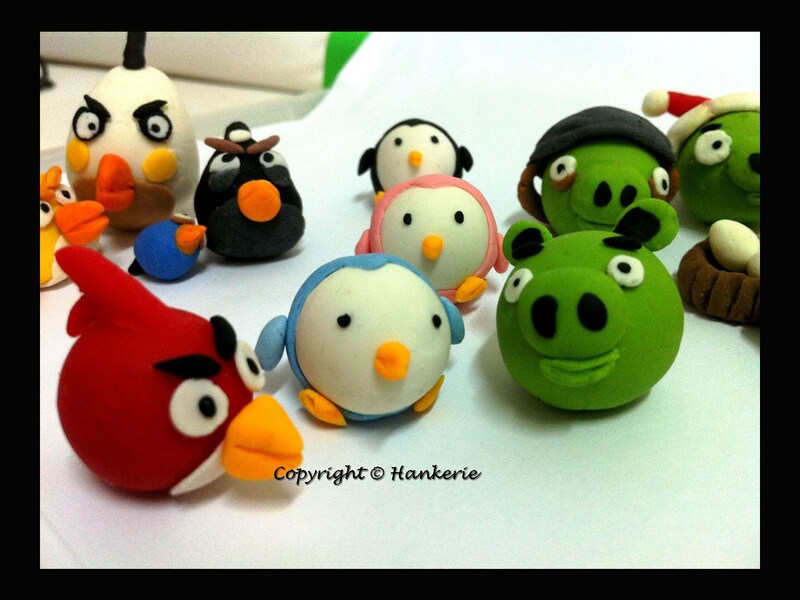 These edible Angry Birds Icing Figures are specially created during my Hari Raya break last 2 weeks ago. They are used for my cakes decoration. In the same time, I've made it into my own Hankerie's story too. 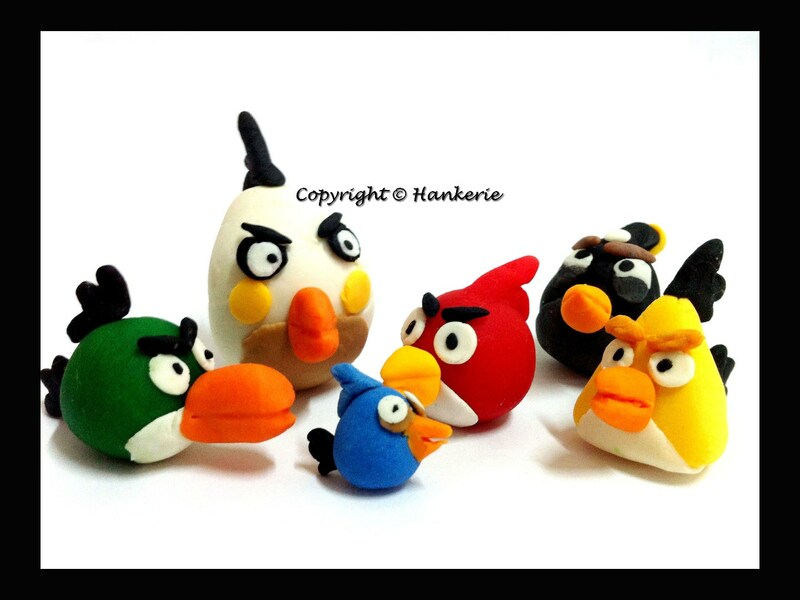 Erm, let's call it as "Angry birds story with Hankerie's mascots". Well, some suggested me in order to give my 3 mascots the name each. Any recommendation? 1.) Once upon time, there is a flock of adorable birds stay happy together. 2. One day, a group of GREEN evil pigs has burgled the Angry Bird eggs. 3.) Suddenly, these adorable birds turned into ANGRY BIRDS. In order to retrieve their eggs, they have to fight against the green pigs and destruct the structures in just few and limited shots. They discuss on the strategy of who go first, when and how to shoot based on their individual strengths. The war officially starts now!!! Let you guess how the war will end? 3.....2....1.... Still cannot think of? Well see down here. 4.) Out of sudden, 3 Hankerie's Mascots appear as negotiators. They come to rescue this situation and make the WORLD peace. 5.) The Blue Hankerie call upon one representative from each group for negotiation purposes. The evil king pig refused to talk to Red Angry Bird and he is still waiting for the super gigantic Red angry bird to appear first. 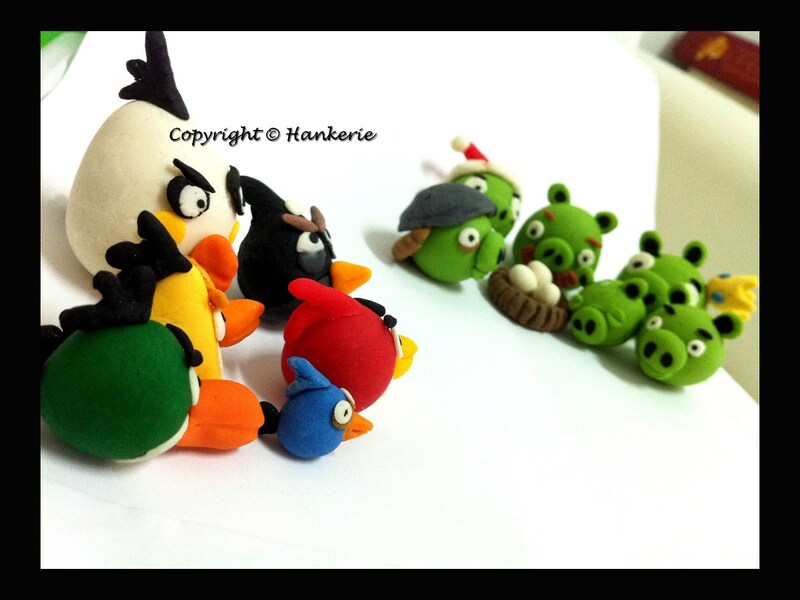 One of the green pig decides to come out on behalf and discuss the deal with Angry Birds. And guess what? Hankerie mascot save the day!!! These are really cute. No wonder you can't have enough of these. My son will be thrilled if I make these edible angry birds for him...I just hope that I have the time to do this. I can see that this is an extreme dedicated job! hahaa...these are real cute! I thought they are the soft toys at first. So pretty! 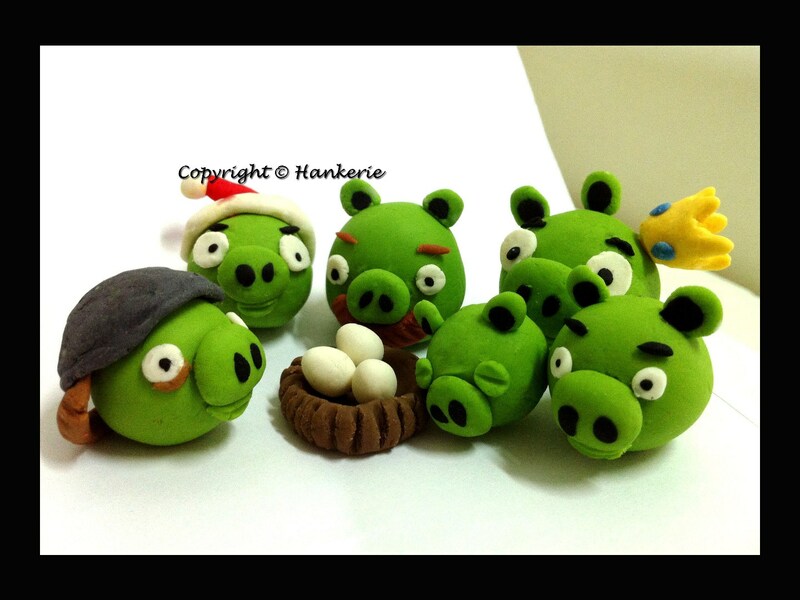 I agree with Ann - they look like soft toys and your sculpting is really accurate - the angry birds and pigs look SO real! @ Zoe: Yes, the Angry birds are so cute, irresistible to make even more now. You should try to make for your son's birthday. @ Ann: Haha...soft toy? 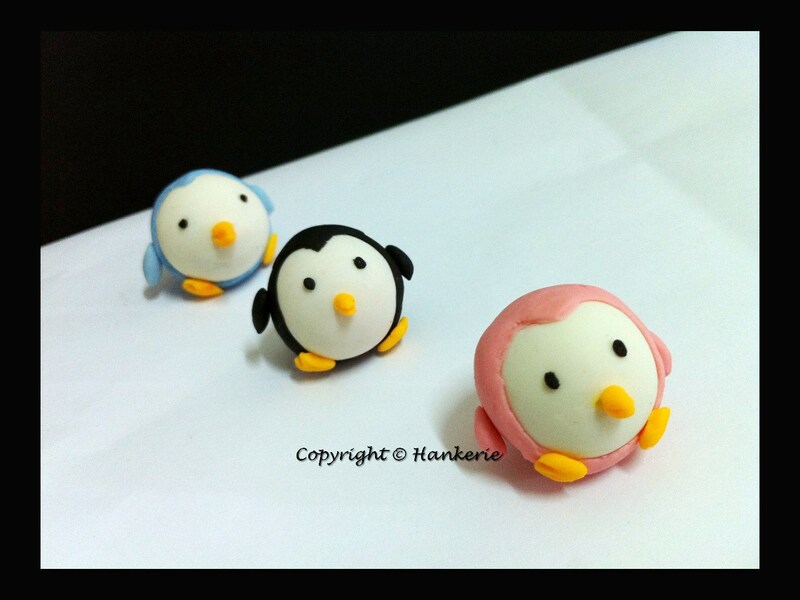 Actually I used up 1 whole day just to do this icing figures. Fun if only do one set. @ Janine: Thanks, dear. Actually there are some crack too on some of the figures. It's indeed tough to make as detail as it is. Story, haha..just dont want the "war" continues in reality! @ Rachel: Which specific green pig that you fond of? Cute, my boys love angry birds too. Thanks for sharing at bacon time. Hope you will join our linky each week. @ Eddel29: Thanks for the linking. @ Mindie Hilton : Thank you. Indeed im enjoying the linky.